Birding Western Massachusetts, by Robert Tougias, 2003. 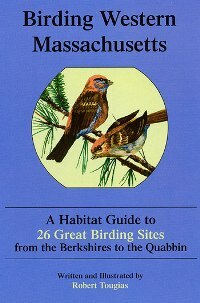 Detailed guide to 26 excellent birding spots in western Massachusetts, using a habitat approach. Areas covered range from Quabbin Reservoir through the Springfield area to the Berkshires. Includes useful habitat and identification tips. 256 pp, 6" x 9".